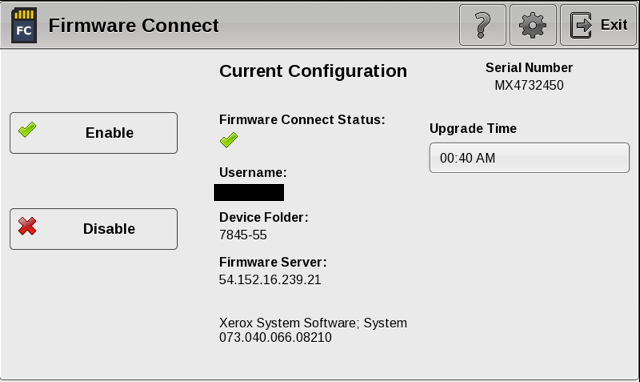 The Firmware Connect App for Xerox Multifunction Printers provides automatic firmware and software updates without partner or customer intervention. Updates are performed sequentially in order of approved firmware versions. All settings are kept at the device. Updates are performed of the evenings or during non-business hours. For devices on ConnectKey version 1.5 (072) or later, the recommended method of installation of the Automatic Firmware Updates solution is by the Firmware Connect App. With the app, the solution is installed in a matter of seconds. To download the app (weblet), click here. You will need your key provided to you by Southern Solutions. For step by step instructions, click here to download our installation presentation. Will automatic firmware updates start the first night after installation? Our back-end system rotates though firmware so it may not pick up the first night but it will pick up in coming days and then updates sequentially and then updates the first night after an update is available. Do DNS network settings need to be entered on the Xerox MFP? Just like with Scan to Email (if email is not hosted onsite), 3rd party solutions and other apps, the DNS network settings must be entered on the Xerox MFP for the Automatic Firmware Updates Solution to work. To download our Installation Q&A document that covers several items, click here. Please feel free to contact us at anytime by email or by calling 301-632-5555 x 5.